Value for money remains the top thing rail passengers want to see improved. 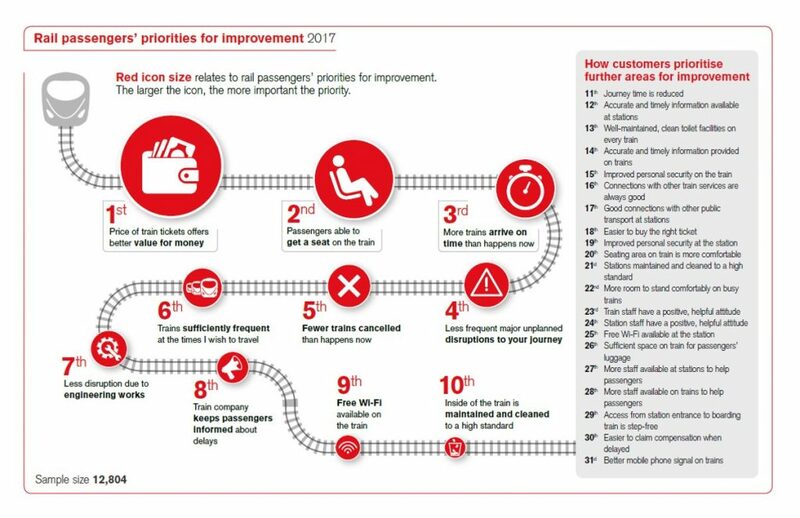 The independent watchdog Transport Focus has asked more than 12,800 people to rank things that would most improve their journey experience. Value for money came top, followed by getting a seat and improved punctuality. This research was based purely on people’s aspirations – the improvements were not costed, nor subject to a cost benefit analysis. You can download the report, below. We have also produced a simulator that you can use to run priorities for different groups of passengers. For example, you can run priorities by region, journey length, age and gender. The simulator also allows you to remove priorities and re-run the analysis – for example, you may want to understand how the priorities change when value for money is excluded. To make it work properly please make sure you enable macros. Some people have reported an issue when using Microsoft Edge to download the tool – if this occurs, please try another browser. The slides produced by the research agency are also available below.